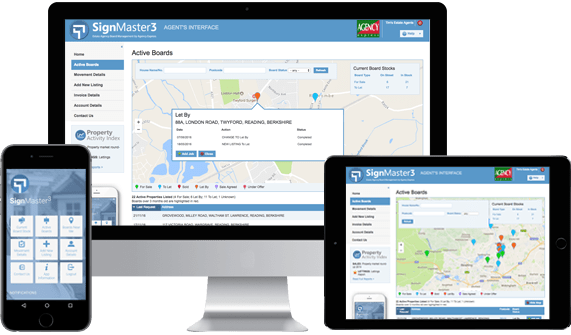 SignMaster3 is the most advanced online estate agency board management system in the industry; it was designed and built by Agency Express and free to use for our customers. Its impressive array of functions enables you to order and manage all of your estate agency board work online through one simple interface, saving you time and cutting costs for your agency. Harnessing the latest technology SignMaster3 seamlessly links to in-house estate agency software including providers such as Dezrez and Acquaint, streamlining the board management process. 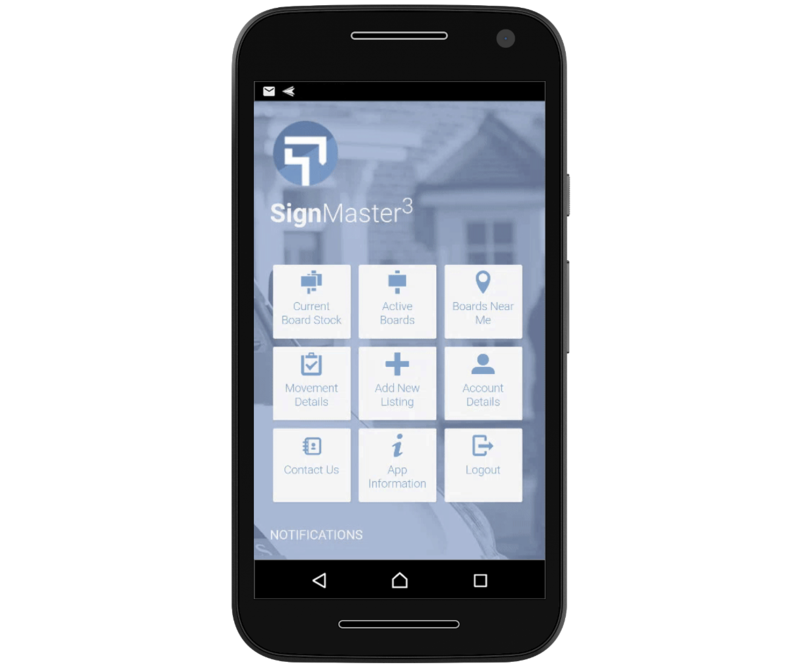 The SignMaster3 App, available via the App Store or Google Play takes online board management to the next level, providing you with effortless control over all aspects of daily estate agency board management no matter your location. SignMaster3 is designed with the sole purpose of ensuring your presence on the street is at its optimum. When taking on new instructions it is important that your agency boards are erected as quickly as possible. 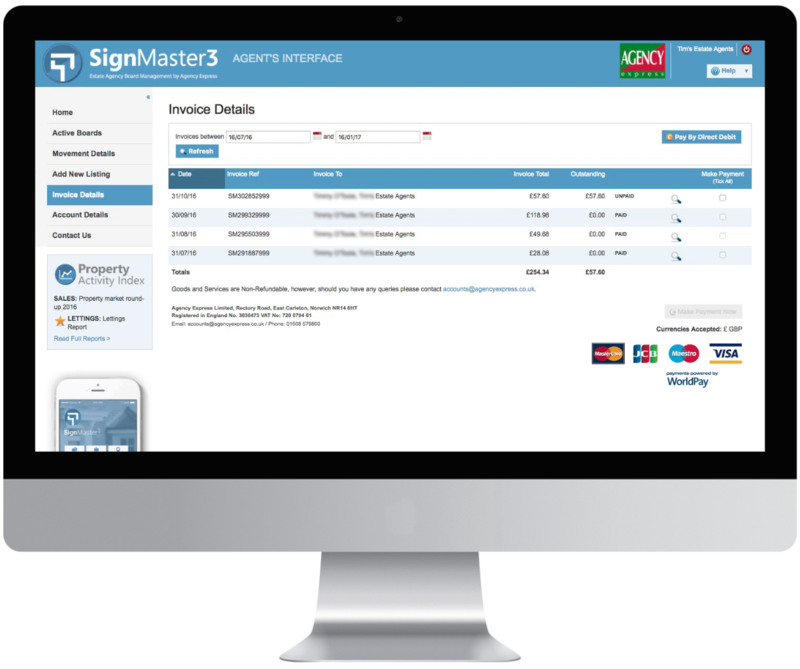 SignMaster3 maximises your marketing time at a property, enabling you to add a new listing without whilst at the property with your client. 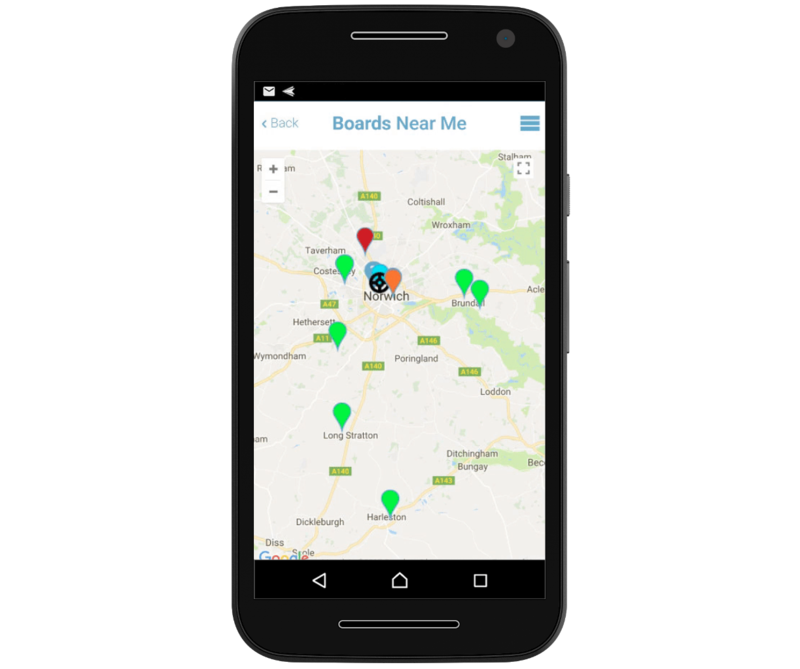 SignMaster3’s Active Boards page not only shows you the location of your boards on the streets, but also their current status and the last time they were visited by your operator. Updating your existing instructions with a status change has also never been easier. If your property has sold, let, or if your board needs re-erecting you can request updates to active boards even when you are out of the office. 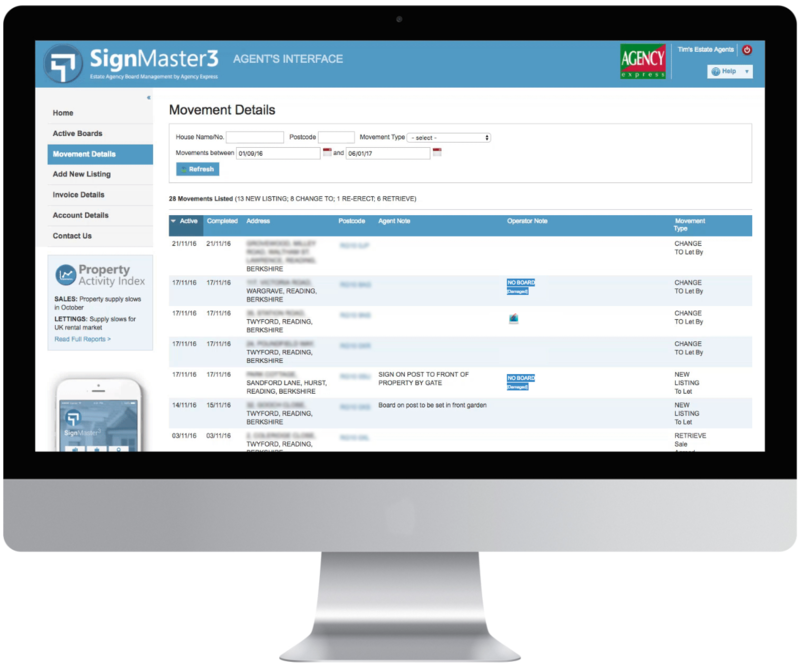 SignMaster3’s Movement Details page gives you real time information on all your board requests, from the current status of outstanding boards to historical information on all instructions. 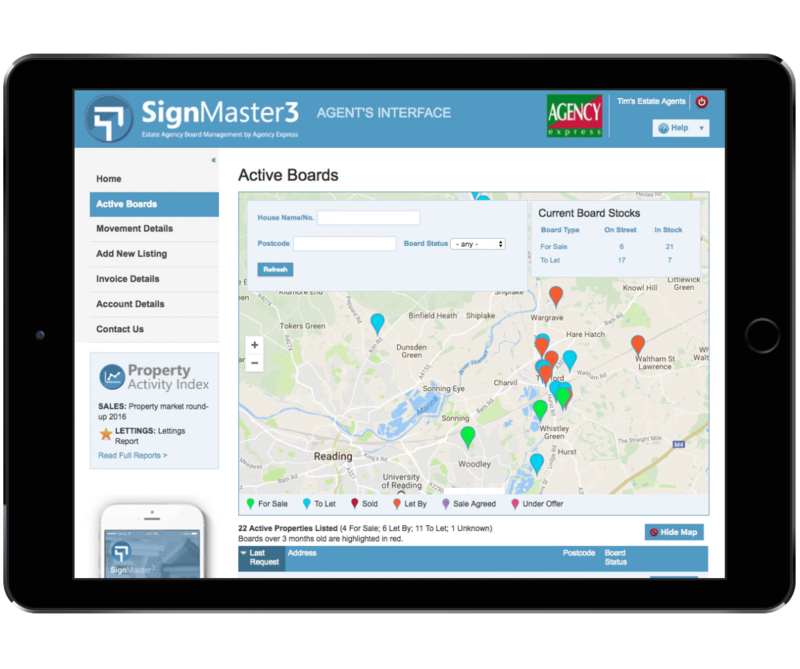 Exclusive to the SignMaster3 App, our interactive board mapping will locate your exact position and display the board’s closest to you, giving you a visual representation of your agency’s market penetration, making the SignMaster3 App the perfect mobile sales tool. SignMaster3’s Invoice Details page allows you to view your last 6-months worth of invoices, including the ability to see every property we’ve visited in that period.